The censer is among the oldest and most widely used vessel in the world. In the west the most common use of a censer or burner was, and is, in a religious setting. A common sight is the thurible, a censer on chain, swung to distribute perfumes by religious figures often in churches and holy places in the catholic and other faiths. Censers have been found in many shapes and sizes through the centuries. From earthenware bowls or pots to the elaborately modelled metal constructions, many designs have an open or pierced body to allow the flow of air. In many cultures, burning incense has spiritual and religious connotations, and this influences the design and decoration of the censer. For early recordings of the use of censer vessels history looks to China. 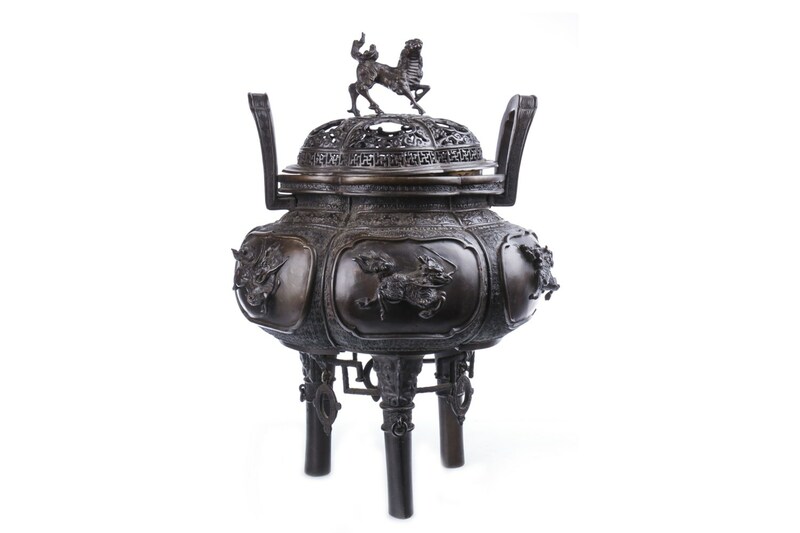 As far back as the Zhou dynasty (770–256 BCE), the Chinese made and used burning vessels for religious and ceremonial purposes. Censer is the most commonly used and occurring word in Chinese, though in the Japanese language one finds the word koro. In Japanese history, the koro was used in religious and ceremonial ways as well as part of the very important tea ceremony. Examples are usually of globular form with three feet, made in pottery, Imari porcelain, Kutani ware, Kakiemon, Satsuma, enamel or bronze. Let’s look to lot 1078 in the Asian Works or Art Auction. The domed lid is pierced to allow air to flow through it, and bears a mythical animal finial. The body also bears mythical animals in relief and the three legs show motifs similar to the taotie of Chinese mythology (one of the four evil creatures of the world and often depicted as a symmetrical styling of raised eyes and nose-like feature but with no lower jaw area). Chinese influences crossed into Japanese art very early, with the movement of artists, products and ideas. This koro is a lovely example of late 19th / early 20th century Japanese art and its essence of beauty within function. Estimated at £300-500, it is sure to light fire under bidders galore the world over. To arrange a valuation appointment,or for advice on Asian works of art,please contact specialist Magda Ketterer, on magda@mctears.co.uk, or call 0141 810 2880.